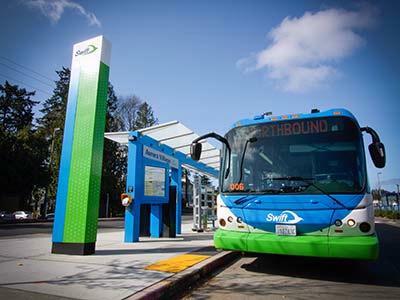 Snohomish County, Wash. – Community Transit will launch its second bus rapid transit line, the Swift Green Line, at noon on March 24. The agency invites the public to a community celebration from 11 a.m. to 2 p.m. at McCollum Park. Swift Green Line buses will run every 10 minutes on weekdays, and 20 minutes early mornings, nights and weekends between the Canyon Park Park & Ride in Bothell and the Seaway Transit Center near Boeing Everett. The Swift Green Line will connect with the Swift Blue Line at Highway 99 and Airport Rd., creating a high-frequency, high-capacity transit network. With stations on Airport Rd. at 100th St., the Swift Green Line will also serve the new Paine Field Airport passenger terminal. Beginning Monday, March 25, as part of its spring service change, Community Transit’s local routes serving Boeing will get extra trips and will terminate at the new Seaway Transit Center. Trip times for these routes have been adjusted to allow time for transfers. The transit center will be a connection point for Community Transit, Everett Transit, King County Metro Transit, Sound Transit, and Boeing shuttles. Seaway Transit Center is only accessible to transit vehicles and does not have public parking. Other routes will be modified to improve accessibility with extra trips and new routing. • Route 107 (Lynnwood Transit Center-Seaway Transit Center) will have new stops along the Mukilteo Speedway and 84th St., serving local businesses and the Future of Flight Museum. • Sound Transit Route 510 (Everett-Seattle) will add two weekday southbound trips at 9:05 a.m. and 9:25 a.m. to improve access during the morning commute. • Sound Transit Route 513 (Everett-Seattle) will be extended to Seaway Transit Center via Casino Rd. and will discontinue service to Evergreen Way and 79th Place. Stops will be added at Casino Rd. and Evergreen Way. Details about the spring service change can be found at www.communitytransit.org/NewService. With every service change, some trip times may be adjusted to improve connections or account for traffic. Riders should check the new bus schedules at www.communitytransit.org/Schedules. • Tuesday, March 19, noon to 12:45 p.m.